April | 2016 | Peroglyfer – Machine Learning changes math. Math changes everything. The problem with todays mobile kitchens or mobile catering is that the weather need to be acceptable so you can eat outside. This problem should not be to hard to solve. Why not have a service for these small businesses? The idea is that you can call this service and they will roll out a mobile food cart or trailer next to your kitchen for people to sit and eat in. This way you have split the problem. You also may be the only driver. I think this idea is worth considering since it will be possbile to sell pizzas and other foods for which you need somewhere to sit. 245 Ideas from Peroglyfer.se . For those without or with a temporary internet connection. Here is the pdf. I think I got another solution for remote support. Not everyone can follow complex instructions. For instance. When a friend have problems with the TV. She could probably not connect it to the Internet for remote support. Maybe she does not even have Internet. What we could use is an AI assistant installed on the machines. The assistent should then be able to solve problems from instructions. Now. The smart thing is that the person in need of assistant can call his friend and let the friend talk to the device. That is. The friend talks to the AI assistant installed on the target TV, laptop or other machine. This is done over the phone. Just turn on the speaker function and place the phone near it. To make things simpler. The support person could use text to speech from a terminal. This way the AI assistant don’t have that much problem recognizing whats beeing said. It could probably also distinguish commands from the other persons talking. So the idea is to bypass the caller and for the administrator to talk directly to the machine by voice using text to speech instead of ones and zeros. Its a kind of a different Internet Of Things. The idea is simple. When is optimation too much optimation? If machine learning is suppose to be as efficient as the brain. It should not relearn all the weights if you want to increase the total number of weights. It will take to long to reoptimize. So the idea is for a system that can be multiplied with as little recalculation as possible. I don’t know how neural networks could cooperate. Maybe the answer from one network or part of it can be improved or rejected by another set of networks. My idea is simple. Inspired by all these AI chat bots why not transform it into a new idea. I’m thinking of creating a book with an AI bot as the interactive storyteller. That is. The bot reads the book to you. In written or spoken form. The interesting thing is that you can interact as with a chat bot as the story progresses. Ask questions and more. So the idea is to create adapted stories that an AI chat bot could have fun telling. The possibilities are really endless. The idea is simple. We remember better if we are engaged. So I thought. Similar to the chat conversations the young students have with their friends. Maybe they remember a conversation with a chat bot equally good. So the idea is to develop an educational bot. The student discusses the problem with the bot instead of just being shown some steps to follow. It could be math, physics or some other subject. I think its a kind of an interesting idea. At least its worth a try. With this you could also have a better mobile educational experience on the smartphone. For refugees and emergency education. Let the bot read the theory to you while at the same time you can interupt the software and ask questions. Even if they are standard questions to begin with. It will be quite powerful. The idea is simple. What if a memory device like a USB-stick or a USB-harddrive would act on its own to verify its content. I think its possible to contruct a smart plan that would give the owner continous information on the integrity of the files and possibly to take some action. If the device finds some error that is. A first simple plan would be to calculate a long list of md5sums and instruct the device to perform the integrity checks. The summory of these results would be visible on a built in screen. The idea is that one would only need to connect the device to some USB power and it would begin to check files by its own. I imagine this would give you time to save your image files well before they all get errors. I have prevoiusly written ”Different Quality Backup Idea” where I argued for using lossy compression to patch existing video files or images. If we are going to have a new image format. Which I think we need. Then it should be error safe. The size of the image file doesn’t matter that much anymore. These memories are more important then saving a couple of 100kB. Even if an operating system like Linux holds many lines of code. I wonder as time goes on. If this process of creating a system could be made more efficient? What if this could be made into a supported tutorial? 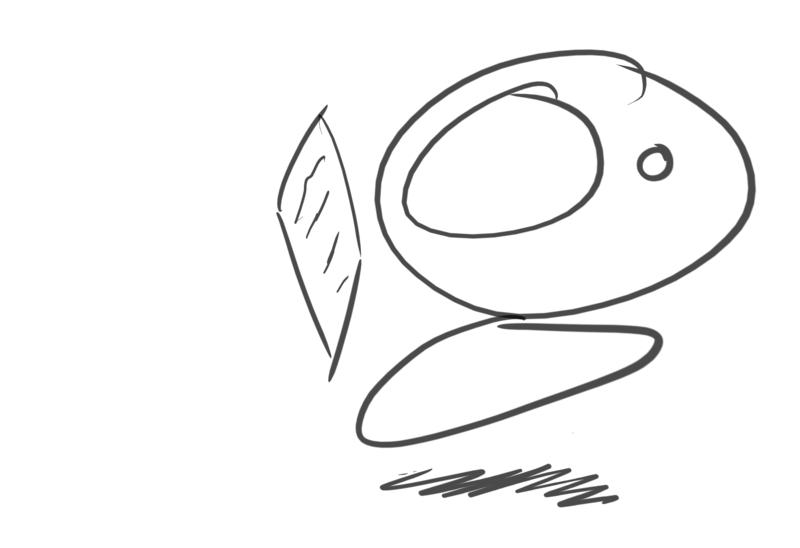 So you have a site were interested people could generate their own operating systems. What I’m saying is that I think every new generation need to figure out things themselves, make their own music or something like that. Maybe they can make a smart operating system using machine learning. On the Raspberry Pi being a platform dedicated to education I think we can have such projects. The idea is simple. As a twist on the Turing Test. Why not instead of having human to AI bot conversation. You have human to human conversation where one of them use the AI bot as inspiration. That is. The response from one of the persons are fed to the AI bot and its answer is fed to another person for rewriting. The resulting response is then presented to the other person. If this is successful. If a judge thinks both parties are humans then one can split the problem of machine intelligence into two parts. One is the crude answer and one is the refinement. It could very well be that all you need is a primitive artificial intelligence as enough information for generating of real intelligence. Hmm, makes me wonder if its true that we are all small deep inside. The idea is simple. Although we have many high quality computer “text to speech” voices. Could we also find voices that are not just sounding perfectly robotic. Voices with accents could be a little better than others for teaching a specific thing. The idea is to let the student listen and rate different voices and accents. The most highly rated should then be the ones the students find they could learn the best from. This could possibly be like music. Different people will have different preferences. But that is a good thing. It just means that the students can choose with a click what voice and accent the enhanced electronic book should have. But the question is. Does there exist voices with accents that are better suited for math and physics? What should we do if some company decides to take over the little fun we still have? I mean this would be very sad for the Raspberry Pi community. I don’t want this in our future. Like the different Linux distributions I think its a good thing if we could get a large group of those mini computers competing. Then with hardware hopping there is a chance of long term survival. But is there a chance for cooperation. I think maybe one could start with a site for news, ideas and feedback from the users. Like there is a Linux.com . Here all the mini computer devices get represented. One such popular idea is to include a open source game engine like Godot Engine with the operating system. So in a Raspberry Pi kit. Instead of just adding a keyboard. You also add a game controller. Another idea for the hardware would be for less monitor cables. With a lot of devices it will be annoying to keep switching cables. Therefore why not develop a fast wireless monitor connection. With lossy video encoding this should be possible. So the only thing you need to plugin should be the power. I solved the travelling salesman problem by hand by dividing it up into smaller problems. My original strategy did not work. There were too many points for my eyes to focus. Therefore I drew an approximate curve to see roughly were I should be headed. The idea is simple. Since you can connect a magnet to some metal to create a chain. I thought. Why couldn’t you split an electric engine. If you could connect the magnetism from a device outside the engine. Then this device could be optimized specially for creating magnetism and not be subjected to construction restraints from inside the engine. Maybe the device could serve several electric engines making the system more effective. If this works I think it would be cheaper than to use a lot of copper wire that would otherwise be involved in creating the magnetism. Idea – Split Components For Electric Engines. Transfering magnetism from outside the electric engine. Since cooling of todays computers requires many large fans and bulky heat sinks. I wonder if there is another solution for this. With the small CPU’s on the Raspberry Pi computer. I wonder if you just can somehow spin the CPU instead. This would save a lot of space then having to use a large heat sink and a fan. With a CPU chip on the end of a fan blade I guess you don’t get any slow moving air blocking the airflow. Therefore like the heading says. Could a computer system or a single CPU be fitted on a spinning fan? I thought I promote my idea of making the traveling Salesman Problem into a game. Its simple. You connect all the dots so that you end up where you started. The least amount of traveled distance wins. 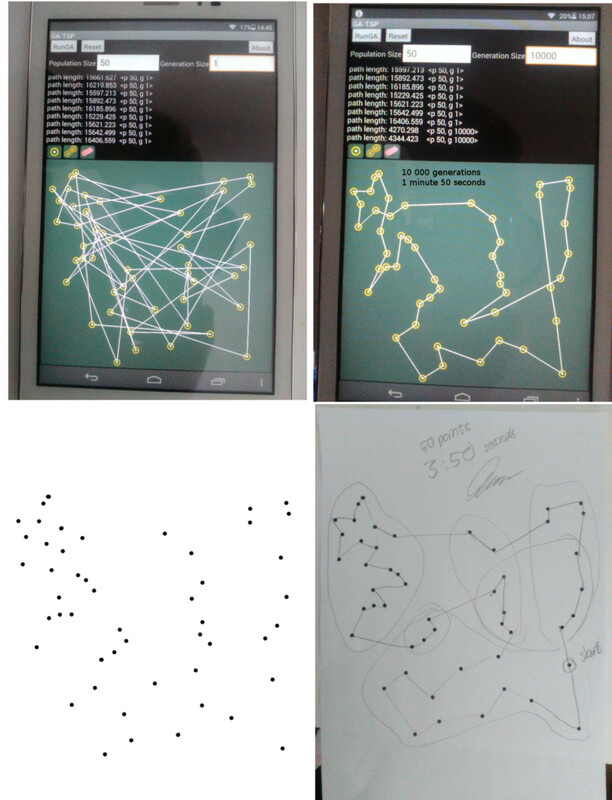 I tested this game using my tablet and an app for TSP solving. I timed and calculated the distance of my solution and the apps computer algorithm. The result were close. I made the 50 point journey in 3205.7 pixel distance and the computer algorithm after 10 000 generation managed to do it in 3426.2 pixels distance. The pixel distance were calculated using the image software GIMP. My time was a bit longer 3 min and 50 sec vs 1 min and 50 seconds for the computer. The problem is solved by dividing the points into rough groups. The groups don’t have to be 100% accurate at the start. Your allowed to cross boundaries so that you can solve the problem. Making the lines surrounding the groups just helps you visually. I had a somewhat philosophical and for me out of the box idea. If we are going to get out in space we need to figure out how we can propel ourselves without using a lot of reaction mass. So I thought. The force we need then has to be similar to the F=ma equation. So then I made a guess from drawing a curve and then squeezing some time period. The acceleration had to be more than zero to get the effect. Otherwise the curve would just remain constant. With a small force from a space drive or some other device then I guess that the acceleration you get from that could then be multiplied by grabbing time. This means the drive need not produce such a large force itself but be safe. So the idea is that you could amplify a small force or acceleration by grabbing time. How this is done I don’t know. I wonder if its not more important to engage the students than to hand them a computer. A computer or a tablet device is important don’t get me wrong. All I ask is that you find creative ways to make use of them. For example. With one device per student maybe they could be engaged in online extra classes that teaches the student with interesting and engaging projects. For example. I’m sure you can find math problems from being a football coach. So my thoughts are an IT-strategy should not be about technology but about people. I thought I share my method for getting a good enough solution to the traveling salesman problem. The problem is that you need to connect all the lines so that you can make the trip with the least amount of traveled distance. I created a graph in octave using a 100 random points. Then as a fun exercise I tried to connect all the lines. Its a kind of a fun exercise. You don’t need a 100 points. Start with something smaller. With a computer program you could possible see how good a solution you can make. Don’t try to solve it all at ones. As in many problems you need to divide it into smaller parts or groups. When I looked at the heat equation I wondered if the solutions were always suppose to be like vector objects. What I rejected was that they are so smooth. Then I remembered that you can maybe use recognition as a way to solve problems. So if we look at a poorly compressed image using JPEG compression we see that it is built up from non smooth connected blocks. The inside of those blocks are still smooth though. Taking inspiration from this I can guess that you can probably get a better solution to certain problems solved by differential equations if you have multiple values for the same line around each smooth object. That is. We surround each smooth object with an almost independent value line. This would create a problem with lots more of unknowns. To calculate or choose these we need some dependency information and that I guess would come from recognition some how. Maybe the smooth solution could be used as enough information. Here you see two smooth objects that each have a different value line surrounding them. Surrounding the matrix of objects are the ordinary boundary conditions. I don’t know how to solve this. The idea is presented as a problem. I calculated Pi from instructions using the Monte Carlo Method from the Wikipedia example. Looking at the result using recognition as a mental problem solver. I can see that there is a lot of unnecessary calculations going on. Let me explain. Monte Carlo Method With Recognition? From the calculations we can all can figure out what the resulting image would be. Maybe computer recognition could then be used to speed things up. So maybe in hind-sight a more advanced method could make a conclusion much earlier. I wonder if this could be applied to other Monte Carlo based problems. Here is my open standard video compression idea. Since with machine learning you can generate from recognition. I thought why not take advantage of this for media compression. It should work for all media and be useful for video or audio transmission. The idea is that you can generate each frame from “enough information”. That enough information is the small amount of information that is then transferred. Mathematically I think this could work if you split the enough information into two groups. One part is a traditional compressed video of much smaller size and resolution. The other part is the enough information needed to scale these low resolution frames to the higher resolution. The scaling is then done by generation or computer imagination as one can call it. It is the computer imagination that is trained. As with imagination in general you will get some information loss but errors will not be detectable. The idea is simple. A guess is that the heat pump can be considered to be a general method? Then why not take inspiration from that to create a device for desalination. I mean with such a device the energy requirement could possibly be somewhat lesser.